The Fall 2015 issue of Computer Music Journal includes an extensive review of Kyma 7 written by composer Barton McLean. You can read the full review, Kyma 7: The Search for the Ultimate Sound Creation Instrument in the current Computer Music Journal, Volume 39, Number 3, Fall 2015, pp 96-102. If you can’t find CMJ at your local book seller’s or library, you can also subscribe via Amazon or find the review online. Kyma 7 is not a routine upgrade but a brand-new program… At first glance, the program’s screen graphics are much more refined and visually interesting than Kyma X. Virtually every part of the program has been significantly changed, with respect to visual layout and functionality. In every way imaginable, Kyma 7 has made the exploration of its vast resources more fun, logical, intuitive, and attainable. Many new areas of help have been added, such as the amazing Capytalk Reference area… followed by many Sound examples that contain the given message in different usages. …the Wave Editor in Kyma 7 alone, in my opinion, would be worth the cost of the upgrade… One can take any sample and produce a Gallery of many distinct Sounds from it, using criteria set up beforehand. Attractively, most of the Prototypes are associated with a complete Sound pathway, so that when one opens a prototype one can immediately hear it in context. Perhaps the most innovative and startling new feature is the Multigrid. As a composer who often uses texture and timbre as prime constituents, I have found the Multigrid to be powerful enough that it has, in effect, changed the way I hear and think about music. … It is also a profound laboratory where one can experiment in order to find Sounds that work, or don’t work, together. Additionally, when one finds a particularly good Sound combination, there is a Sound extraction mode where, instantaneously, this combination can be converted into a traditional Kyma Sound, with all of its parameters and routing controls intact, to be used in a Timeline. This capability is truly magical and unprecedented. [Kyma is at] the sweet spot between having the highest-level software language possible, consistent with the greatest variety and flexibility in producing sounds, processors, and controls. In my opinion, no other software design has come close to achieving this balance. …moving away from notes and toward sounds was, for me, very healthy and invigorating. Another attractive aspect about Kyma is its superb audio quality… Simply put, it just sounds beautiful. This illustrates another—perhaps the most relevant—feature of Kyma 7, namely total integration. 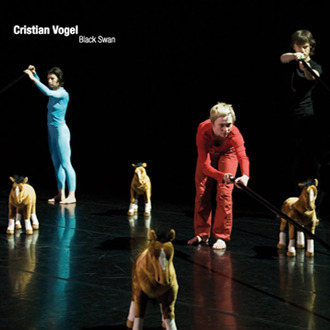 Long before Natalie Portman donned the sequined black bird’s eye makeup, composer Cristian Vogel and choreographer Gilles Jobin were collaborating on their own Black Swan, the music for which was released in December under the Sub Rosa label (SR303). Those who follow Vogel’s movements will already know he is deeply involved with the legendary Kyma digital synthesis/sequencing system, and ‘Black Swan’ feels like the perfect extension of those interests.